Everyday tasks just got more efficient. 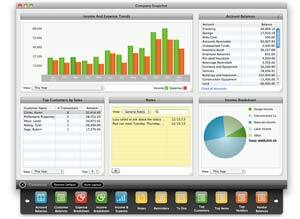 Easy to set up, learn and use, QuickBooks for Mac can quickly organize your business finances and show you exactly where you stand. Instantly create invoices, track payments, manage expenses, and access information.No time to customize? Choose from a variety of newready-made templates and instantly look more professional. Save time and easily manage your business on a Mac. Organize your finances all in one place and save time by tracking the money going in and out of your business. 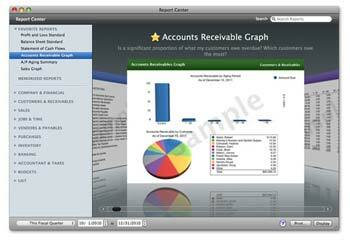 This license allows you to install Intuit QuickBooks 2011 for Mac for a single user. A three-user license is also available. 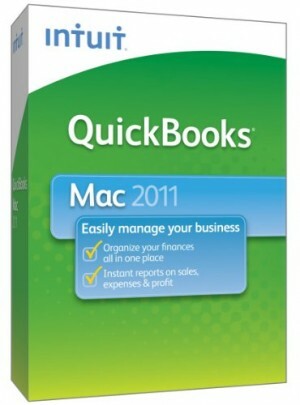 QuickBooks 2011 for Mac looks and works the way you’d expect a Mac to. Save time completing everyday tasks like tracking and managing expenses, invoicing, and printing checks. 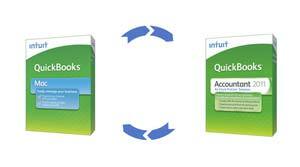 Process your payroll right within QuickBooks using Intuit QuickBooks Payroll for Mac (additional fees apply). Save money and time by processing card transactions directly through QuickBooks for Mac with Intuit Merchant Service for QuickBooks for Mac (additional fees apply). 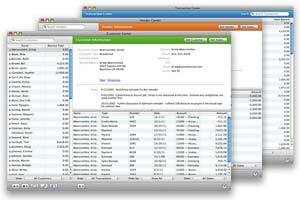 From the Home Page to the Customer, Vendor, and Transaction Centers to the Company Snapshot, QuickBooks for Mac makes it easy to access what you need, when you need it. QuickBooks also lets you choose from over 100 standard reports to see where your business stands. And it supports both Web Connect and Direct Connect, making it easy to quickly import downloaded bank and credit card transactions from participating financial institutions into QuickBooks. Personalize forms, like estimates, invoices, statements and more, by adding logos, images, and fonts with Layout Designer. Customize your toolbar to access key tasks in a single click. Work on the platform you prefer and get the most out of your Mac–sync your contacts with Address Book back up files to your MobileMe account, and add reminders directly to iCal. Easily share your data with your accountant or other Windows-based users. QuickBooks 2011 for Mac requires Mac OS X v, 10.6. With Little Square, Guide Me, New Company Setup Assistant, and onscreen help. Try QuickBooks for up to 60 days at no risk. If you’re not 100% satisfied for any reason, please call Intuit customer service within 60 days of purchase to request a refund. To process your request, the agent will need the product license number located on the CD. Prevent painful data loss by backing up your QuickBooks file to MobileMe (requires MobileMe account sold separately). Choose one-time or ongoing automatic backup. You can restore it at any time. 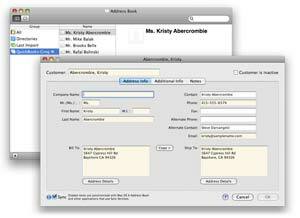 Save typing time and errors by effortlessly synchronizing contact information between QuickBooks and your Mac. Organize your customer, vendor, and transaction information in one place. Share your QuickBooks data with Windows-based users, such as your accountant. Visit Little Square, a free, online magazine created especially for QuickBooks 2011 for Mac users to help answer your questions. The magazine includes videos and columns written by QuickBooks for Mac accountants, advanced users, and the QuickBooks for Mac product team. Internet access required. Receive payments from customers easily using integrated credit & debit card processing (additional fees apply). QuickBooks Payroll for Mac allows you to easily manage payroll online and export data into your QuickBooks software (additional fees apply). Make billing customers faster and easier when you track time and job costs. And use mileage tracking to stay on top of your job-related mileage for reimbursement at tax time. Personalize forms, like estimates, invoices, and statements quickly and easily. Add logos, images, and fonts to templates and create your own custom forms. No time to customize? Choose from a variety of newready-made templates and instantly look more professional. Get pre-designed, customizable business reports to gain insights into your business. See all available reports in one screen to easily choose the right one. Drill down with one click to see the detail behind the numbers. Export any report to Excel or Numbers–your QuickBooks formatting and formulas go with it.